This third week of our summer cooking camp was all about using farm fresh and seasonal vegetables. The Passion for Spices team focused on teaching campers the importance of knowing where your food comes from, identifying in season fruits and vegetables, and creating fresh and summery foods. To begin the week, our first day was all about soups; cold soups and summery soups specifically. Author May Fridel taught the campers several different techniques for crafting soups using fresh vegetables including: avocado cucumber soup with fresh picked herbs from May's cookbook Indian Cuisine and Diabetes Cookbook, a Russian style vegetable soup, and what became their favorite soup, gazpacho, all served with crusty country bread! The second day was no less exciting as the campers learned how to turn ordinary farm fresh vegetables into culinary masterpieces from scratch! First they were asking, "If there is any meat in the chili," but as they tasted the soups, with all the flavors and different textures they relished it. The campers finished the day making Moroccan Tajine, Spanish Escalivada, and vegetarian chili; all the while snacking freshly cooked chickpeas as they prepared the dishes. A highlight of our week was the trip to Murph Farm in Chatham. Eliza Murphy, owner of the farm, gave a tour of the farm, where the campers got to feed the chickens, pick vegetables, and learn how their favorite fruits and vegetables are grown. The campers had fun picking vegetables like cucumbers , many varieties of tomatoes, eggplants, and zucchini, as well as fresh herbs.. 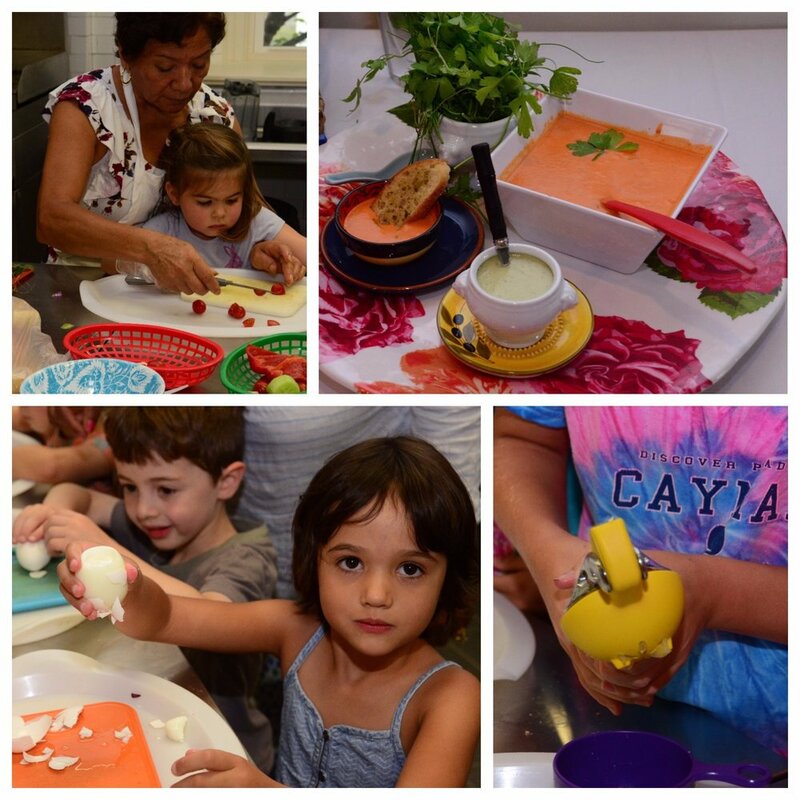 They kids experienced a real farm to table concept, where we made fresh pizzas to foccacias, and used the vegetables straight from the farm. We also made fresh fruit baskets, and honey lemonade. On the fourth day, the campers learned how to incorporate farm fresh eggs with seasonal vegetables, making dishes such as quiche, summer frittatas, and Korean pancakes! Friday featured guest Chef Bob Conway, owner and baker at Brownie Points Bakery in Summit, NJ. Chef Conway taught the campers how to craft free form handmade pies, including apple crisp, peach cobbler, and a delicious plum crostata! All the fruits were picked from Race Farm in Blairstown, NJ. We are looking forward to next week, where parents cook and eat together with their kids. We have a few more seats left. We have many fun themes including "Oodles Noodles Class" where we learn to make soba noodles from scratch. This is going to be an exciting last week. So calling all families to come cook with us with your kids/teens. Click here for the Camp Brochure to learn more about our last week!